There are plenty of full face helmets but which is the number 1? What helmet is best for you? We took a look at our top helmet picks for 2019 and sized them up to each other. We took helmets from the best brands around and ended up with our guide to the best Full Face Helmets of 2019. There are plenty of good full face helmets out there but there are only a few from the top brands and helmet manufacturers which can truly be counted as the best. 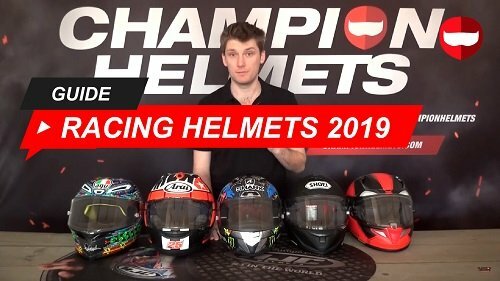 At Champion Helmets we were able to get our hands on the best full face racing helmets of 2019 and we are going to go through each and every one of them. Let me introduce them to you. We have the HJC RPHA 11, Shoei X Spirit 3, Shark Race R Pro GP, Arai RX 7V and AGV Pista GP R. And with the Shark we have taken the Race R Pro GP because it represents the very best from Shark and that is what we are interested in. These helmets are also ordered by their price as well, with the RPHA 11 being the lowest and the Pista GP R the highest. To compare these helmets, we will be looking at their features like the shell, ventilation and liner but also their value and overall feel. We have compared all these helmets in the one size for fairness and that is the M size or ML for AGV because they don’t have an M size. If you want to know more about each specific helmet, you can check out our reviews of them plus make sure to subscribe to our channel to see our latest reviews. We will start at the lowest costing helmet here, the HJC RPHA 11. The HJC RPHA 11 is a great helmet which manages to deliver a surprisingly large amount of quality and comfort for a helmet that starts at about 360 USD. It is actually almost half the price of our next helmet on this list. For that 360 USD we actually get a PIM material in the shell which is made out of Carbon fiber, Aramid and Fibreglass. This is a great material which combines the strengths of each material to make a strong and light shell, that doesn’t double the price. On top of that, it doesn’t pull on you at high speeds and the spoiler at the back really helps with the aerodynamics. The weight is 1.35 kg and that is quite good for this type of helmet. The ventilation is pretty good as well with lots of options and you can have gloves on but still use them. We have a wide visor with a pinlock, tear offs and all that. The inner liner is multi cool so it is removable, antibacterial, washable and all the good stuff. It feels quite comfortable as well but isn’t the best at reducing noise. A major plus for HJC are the designs from brands like Disney and marvel which I highly recommend that you check out because they get some pretty cool ones. As a racing helmet, the RPHA 11 does great. Sadly the RPHA 11 only scored 3 out of 5 stars on the Sharp test. This is something of a let down and represents the lowest score on this list. The shell will still offer protection but a perfect score is obviously best. The HJC RPHA 11 offers protection, comfort, ventilation and aerodynamics. For a helmet coming in at the lowest price point, it certainly doesn’t feel like it. 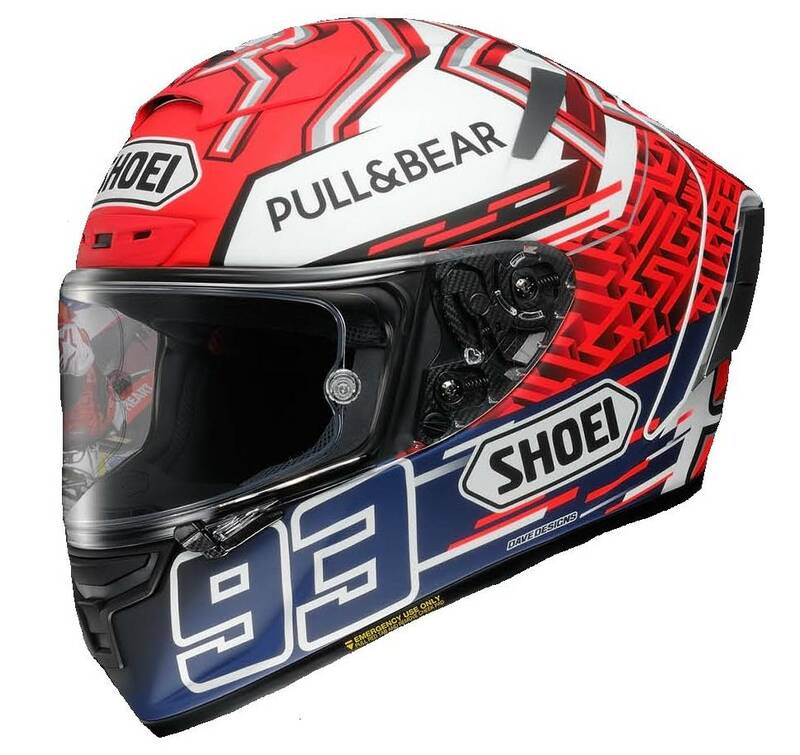 Now, surprisingly the 2nd option on our list is the Shoei X Spirit 3 or X 14 for our American friends. At 730 USD it is only just in the second lowest price position but this is a fantastic helmet overall. It is made out of a similar material to the RPHA 11 but this time it is called the AIM + material and it is a mix of organic fibres, aka maybe carbon fibre and fibreglass. The weight is also good at 1.35 kg. The X Spirit III is a strong helmet too because it has a 5 star Sharp safety rating which is top in terms of safety standards. Generally I would rank everything as being just a little bit better than the HJC RPHA 11. The ventilation and noise isolation just feel stronger overall. The aerodynamics of the helmet is also a top feature. The interior padding is one of my favourites as well because it just gives you what you need. It is cool, dry and provides good coverage. Overall, the X Spirit 3 is a fantastic premium racing helmet with a high quality feel which sets it apart from the rest. 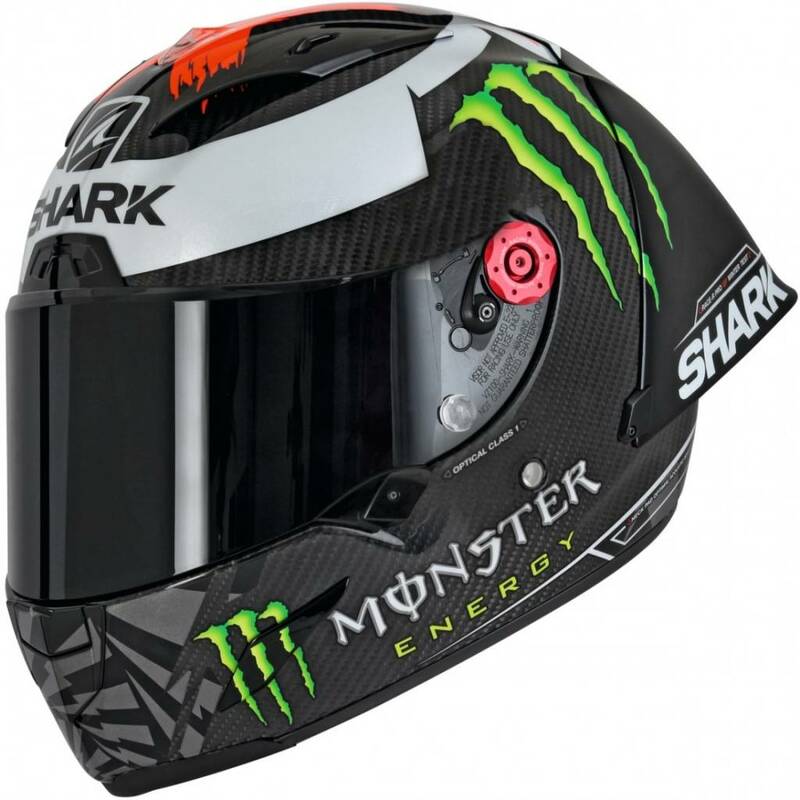 Surprisingly, the Shark Race R Pro GP is our third highest priced helmet on this list and it sits exactly in the middle. At 750 USD, this is a no holds barred racing helmet and has plenty of premium features to justify the price. The shell is made out of a carbon and aramid blend which is super strong and light. A result of these lightweight materials is a weight of 1.30kg, which is the lowest on this list. This was a bit of surprise for me as well. Then it also has a 5 star Sharp rating giving it top marks in safety. The visor is strong in all aspects except that it is not pinlock anti fog lens prepared. The liner is also comfortable, but just not quite as comfortable the Shoei X Spirits liner. Ventilation is great though and the racing aspects of this helmet have been finely tuned. This helmet is a big step up from the standard Race R Pro and does everything very well. Coming in at our 4th position is the Arai RX 7V. 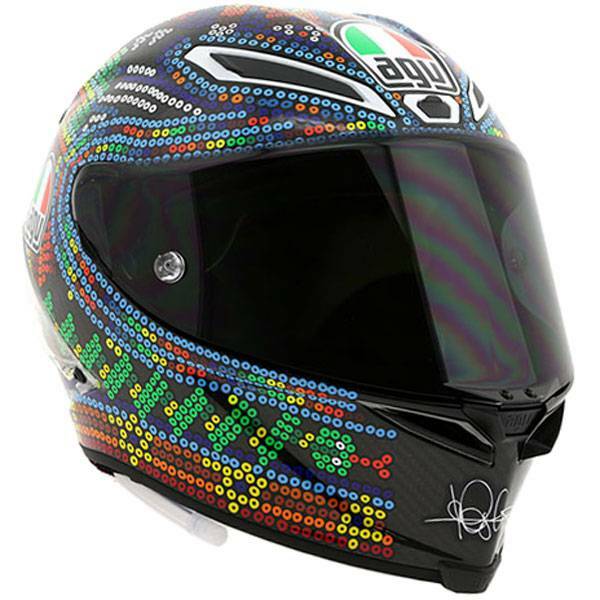 This helmet is very comparable to the Shoei X Spirit 3 and will set you back 770 USD. Like the Shoei, it has a different name in America where it is known as the Corsair X. The shell is mostly made out of fiberglass and has a few cool features to offset its lack of Carbon Fibre but it is still pretty safe. Because of this it is going to weigh 1.65 kg which places it as the heaviest helmet of our list. It does have a 5 star Sharp safety rating but Arai wants to focus upon glancing off of impacts rather than absorbing them and for that purpose we have an almost round helmet shape, with almost nothing sticking out. 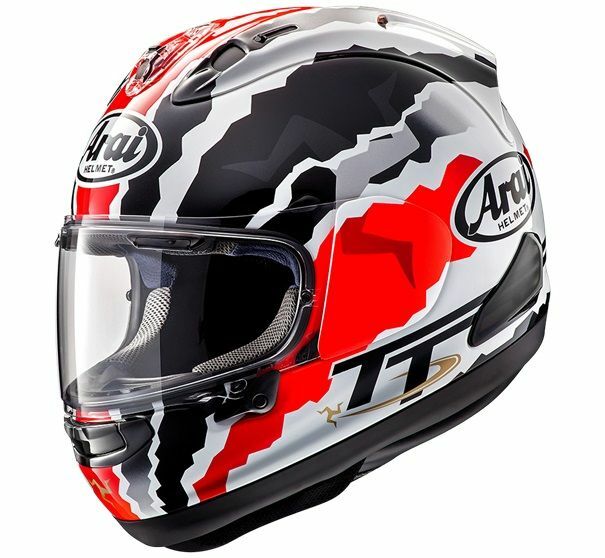 This is a pretty unique feature from Arai and is simply another take on safety. The visor fits into this and has some cool features like the Variable Axis System, vents on the visor itself and the pods on the side to reinforce that area. The ventilation system is strong and has plenty of options too but isn’t exactly user friendly. I like the liner. It feels good to wear and provides plenty of options. The Arai is maybe the most unique helmet on this list and that makes it pretty interesting. Finally we have come to our last helmet and it sits in a class of its own. The AGV Pista GP R is the full stop when it comes to racing helmets. This 1400 USD helmet has a 5 star Sharp safety rating and a shell made out of carbon fibre. So it is top in terms of safety and weighs in at a respectable but unremarkable 1.45kg. This helmet is super specialized for racing though and this has affected a few things. The ventilation is great but you cannot open or close the vents without taking the helmet off and the noise isolation is almost non-existent. The visor is very wide and deep, the ventilation is very strong and the aerodynamics are class leading though. So compromises were made for a better racing focus. It also comes with a built in hydration system so you can drink while racing and it’s just another feature of the absolute racing focus of this helmet. The spoiler will also detach under pressure. As a road helmet, the Pista GP R is terrible but if you’re trying to set new best lap times it is perfect. Now that we have looked at them separately, let’s take a look at how they compare to each other. It is difficult to say which one is best and that is because they all do similar but different things. The Arai for example focuses on glancing off of impacts, the HJC has a value focus and the Pista GP R is nothing but race focused. So let’s start with just the best racing helmet. The AGV Pista GP R wins hands down. It has everything you would want and does everything track related the best. The best helmet in terms of value is the HJC RPHA 11 though. If you want a safe racing helmet which can also be used on the road, the RPHA 11 will do best for you. If you find that you share the same thoughts on safety as Arai, then that is best for you. I can say though that the Shoei X Spirit is best in terms of overall quality. So let me simplify this. For racing, the AGV Pista GP R wins. For quality, the Shoei X Spirit 3 wins. For value, the HJC RPHA 11 wins. When it comes to the best racing helmets, work backwards from this list as the degree of racing specialization lessons, so does the price. The Shark Race R Pro GP is specialized for the track like the AGV Pista GP R but is just not quite as good but it is also 450 USD lesser in terms of price to balance that. For me, my pick goes to the HCJ RPHA 11 simply because it will do what you want for less and I do not need a full track helmet. This is highly dependent on your personal needs and situation. This is really what we expect when looking at the best helmets from the best brands though and we offer all these helmets in our online store at championhelmets.com. If you scroll down on the product pages of these helmets, you will notice that all of them come with a free dark smoke visor if you pick one up at Champion Helmets. I hope that this guide has helped you out or at least cleared up a few things for you. These full face motorcycle helmets are all great options and will give you great performance when racing. I mean these are the best full face racing helmet of 2019. Whether you ride a street bike or tear up on track days, these are the best of the best. Remember that you can find reviews and more of these helmets on our YouTube page and make sure to subscribe while you’re there.